MP Lui Tuck Yew in Jalan Besar GRC??? I know the place that I'm staying is under Jalan Besar GRC. 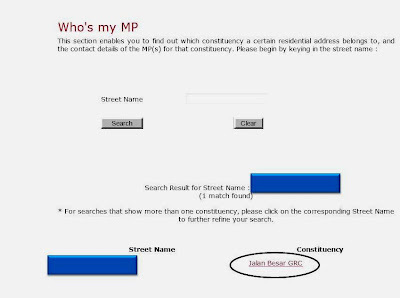 A cursory search on the Parliament website says so too. 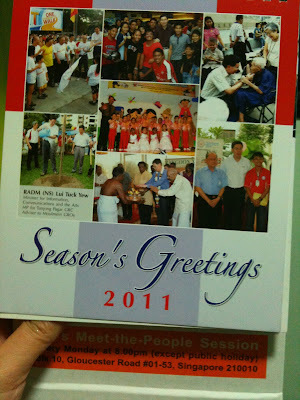 Today I went to open my letter box and found a nicely, coloured calendar for year 2011. The front page of the calendar consists of a photo collage of Mr Lui Tuck Yew engaged in grassroots activities. I thought to myself why Lui Tuck Yew? I thought my place belongs to Jalan Besar GRC? 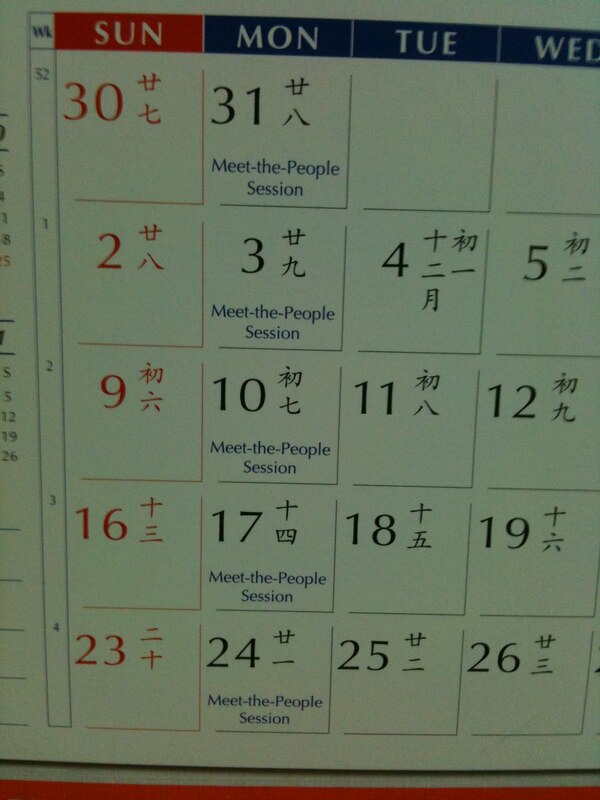 I should be seeing faces of Yacob Ibrahim, Heng Chee How, Lee Boon Yang, Lily Neo or Denise Phua instead. I continued to flip the pages. 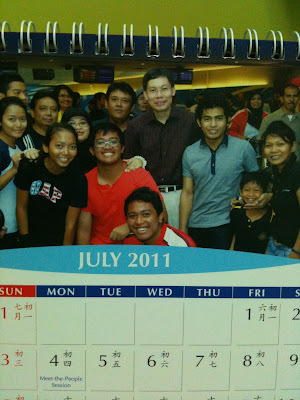 January showed a picture of the Tanjong Pagar GRC team. 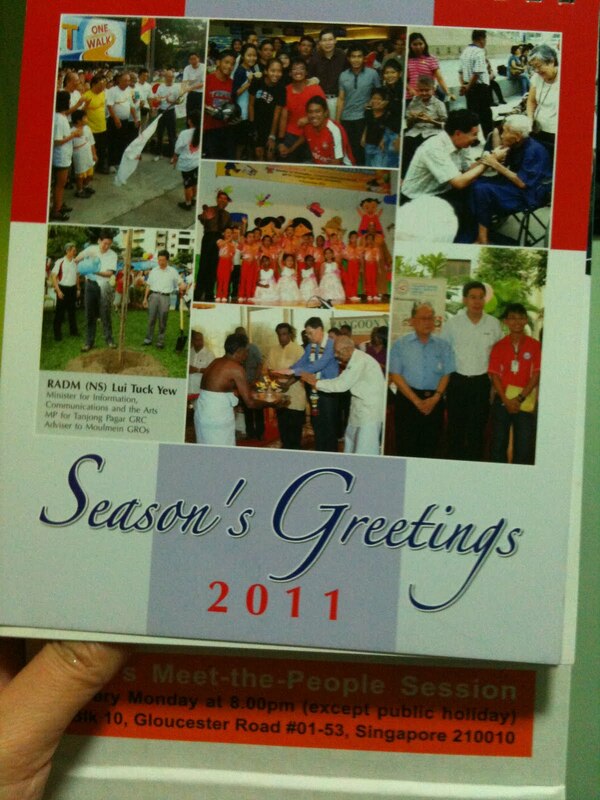 Subsequently, from February to December 2011 are pictures of Lui Tuck Yew and his grassroot activities. 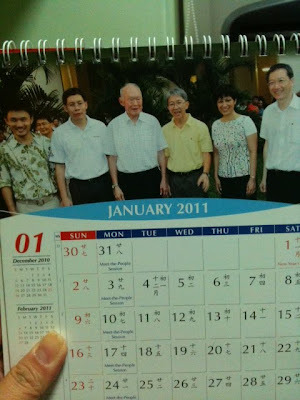 The calendar is handy and it also indicate the MPS dates for every month but I'm bewildered by the choice of pictures in this calendar. 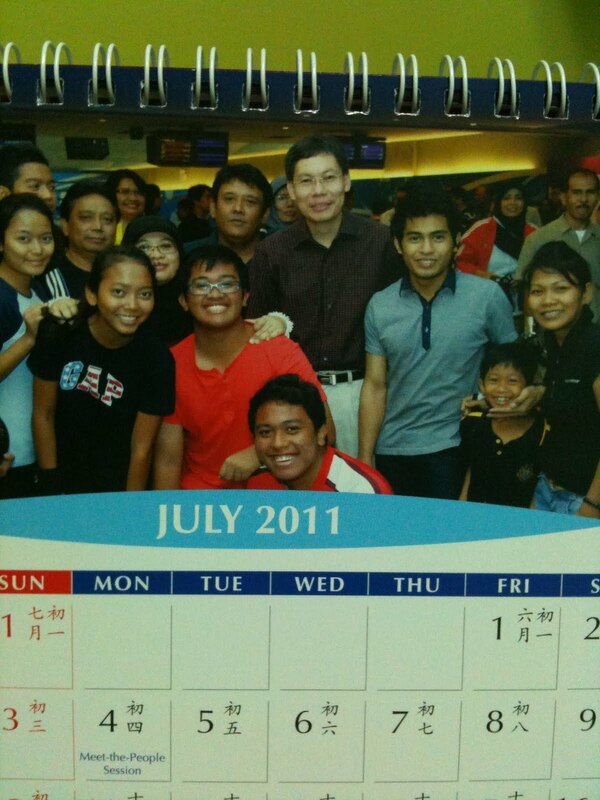 I should be seeing pictures of my MP and his MPS dates not Lui Tuck Yew! GE is around the corner and what is required to cover the ground? It is of no surprise that not many people or voters are aware of the amount of effort and time required during campaigning period. This could be due to the lack of information or voters could not be bothered. With GE around the corner, I re-revisited the book from Dana Lam, 'Days of Being Wild'. I came across this segment and I thought it would be good to share this with everyone who is reading this. This book was written and published after GE 2006. "We always tell people who join us, we must be a respectable party. 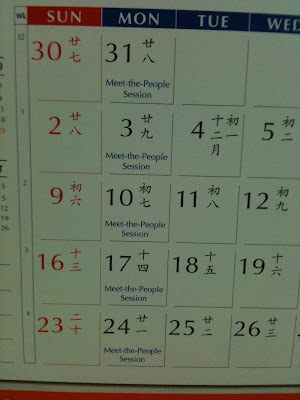 People must see the meaning and find it meaningful to join the WP. So you must take the correct approach to politics. We serve Singapore by having people who were concerned, like-minded citizens to come forward and get on board and we provide the people with a choice. And for Singapore to move towards a First World nation, this itself I think was a national service to Singapore. Whether you were elected or not, was something else. But it must be something meaningful for you to do,' Said Low Thia Khiang. Campaigning was tedious word, exacting mental and physical endurance from each individual. It was highly labour-intensive. What the party did not have in numbers, it more than made up with the individuals' willingness to put themselves on the line. As Low said, 'We have small group of people doing a lot of things. And we depend a lot on the individual stretching, even over-stretching himself or herself on the job.' Here are some of the roles in an election campaign. Every candidate was assigned an EA whose function included seeing to the collection and filling of the candidate's nomination papers. He or she also kept track of the election expenses of the candidate. In a GRC, a Principal Election Agent (PEA) was elected from among the EA to represent the group. EA to ensure all necessary forms for candidates were collected in person before Nomination Day. Forms had to be signed and signatories must be present on Nomination Day at the respective centres. Permit to hold rally was issued to EA. EA is made responsible for everything that happened at the rally. He or she is the main liaison with the police on law and order issues from traffic and crowd control to how and where the stage was set up. A list of names and particulars of speakers was submitted to the police beforehand. EA also arranged for transport and catering of dinners for the candidates and their helpers. All EA had to take an oath of secrecy which meant they were not allowed to divulge what they know. For every candidate, there had to be a proposer, a seconder and 4 assentors who had to present themselves with the candidates at the respective nomination centre. Assentors had to be residents in the respective constituency. 2 things were necessary for holding a political rally; a rally site and a police permit. Rally sites were designated by the police who cited law and order concerns for designated open fields for the purpose. But these areas were hard to access! Consequently, stadium venues were considered choice sites because of available seating, shelter, lighting and easy access. Candidates were not allowed to use the PA system in the stadium -- for law and order reasons. Limited opportunities for a choice site was what drove political parties to deploy 'proxies' to queue overnight at the Police Complex at Cantonment road. Sites and permits were issued only the day before the rally. This meant that for about 8 nights (9 days to campaign) between Nomination day and Polling day, the party had to find people who were willing to spend the night at the Police Complex. This day-to-day application process also explained why it was virtually impossible to have a calendar of rallies and their times and venues in advance. Required by police regulations, they ensured that people attending the rallies were orderly and knew where to go. These helpers got to be aware of what is allowed and what is not. Tasked with watching over the procedure at polling centres, they were sworn to secrecy and could not divulge what they knew. Generally, they tried to see to it that voters were not intimidated or unduly influenced by any party present. These were also sworn to secrecy. Generally, they had to have a keen eye and were tasked with watching over the counting of votes. Apart from the above mentioned, there are a lot more manpower required!!!!!!! I was both Polling and Counting agent in GE 2006 and I have to say that I'm glad that I volunteered myself for it. The experience was wonderful and how many 5 years do you have in your life to take part in experiences like that? In conclusion, as a true-blue Singaporean, what role would you like to take on for the up-coming GE? Here is wishing everyone good health, wealth and prosperity!